Shakespeare’s work includes many wonderful female monologues—spanning the comedies, tragedies and histories. As the plays were originally performed by all male casts, the staging of these roles by male actors provokes a reconsideration of the works, and can prove popular with modern audiences (as seen in Mark Rylance’s successful all-male casting of Twelfth Night). The Third Beauty: Shakespeare's Women is an interesting concoction of female monologues, extracted from several of Shakespeare’s plays. The lines were all written by Shakespeare, but then ‘mashed up’ by Michael Beh, creating an opportunity for Warwick Comber (Blue Mage), Andrew Fraser (Gold Mage), and Patrick Shearer (Pink Mage) to demonstrate their versatility, and to savour the opportunity to perform extracts from several major roles. During the 70-minute performance, the Spring Hill Reservoir audience were treated to the words of Gertrude, Juliet, Hermia, Viola Olivia, Ophelia, Titania Cleopatra, Queen Margaret, Portia, Miranda, Desdemona, Helena, Rosalind, Beatrice, Nurse, Lady Macbeth, and the Three Witches. Following an initial, whirling frenzy of exchanges—where roles are thrown between the Mages and into the air—the performers promenade through the space, enacting the different texts. The pared-back staging (occasional raised platforms and chairs) includes the use of white feather fans, and balls, but emphasis is on the actors. Many of the early speeches appear to be demonstrations of ability, developing into much more of a competitive exchange or ‘duelling’ between the artists. Although often more frenzied, the ‘duelling’ delivers an intensity which contrasted with some lines which, I felt, occasionally missed the context of the play that they were extracted from. Picture: Andrew Fraser (Gold Mage), and promenade audience, in the Spring Hill reservoir. Picture credit: Creative Futures Photography. Pictured (L to R): Andrew Fraser (Gold Mage) and Warwick Comber (Blue Mage). Picture credit: Creative Futures Photography. The Third Beauty: Shakespeare's Women is clearly a work of love from Michael Beh—who not only adapted Shakespeare’s text to create the work, but is also credited with production design, and as producing director. The Spring Hill Reservoir is a good choice for the promenade production, offering great acoustics and a chance for the audience to be very close to the performers. Beh surrounded himself with a great creative team: excellent costume, sound design (Peter Crees), and lighting design (Jason Harding, rigger credit). The music was great, and the lighting of the reservoir worked really well—both on arrival and also throughout the show in the hands of the three ‘angels’ (although I’d have preferred not to have had the distracting flashing of lights during the excellent Juliet speech). 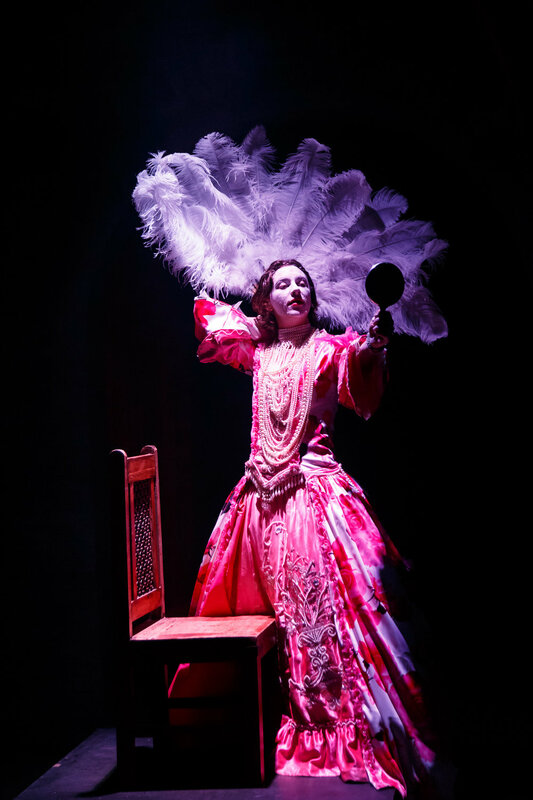 The Curator's website describes a vision of connecting independent, professional artists to “bring classical theatre to new life.” The production certainly created an opportunity for emerging and established artists to work together in a celebration of their shared love of Shakespeare. Shearer, described by The Curator’s as an ‘emerging artist,’ relished the variety of roles (a highlight for me being Portia’s ‘quality of mercy’ speech). Fraser was superb as Lady Macbeth, and Comber gave a compelling and dominant performance in his many monologues. Just occasionally perhaps, a little more ’delicacy in their application’ might have been needed for some of the speeches (for example, there too much emphasis on the articulation or accenting of the text—such as Comber’s rolling of the Scottish rrrr’s). 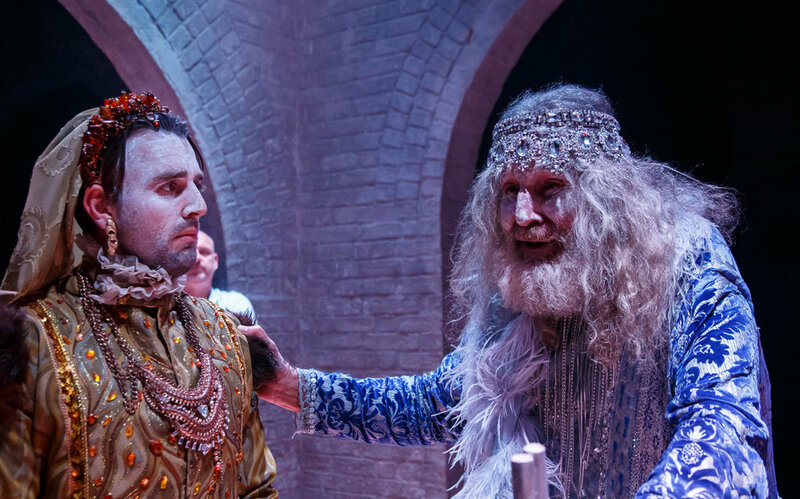 But each of the Mages more-than demonstrated what they are capable of, leaving me wanting to see more work by each of the actors (and definitely wanting to see Comber as King Lear). Picture: A powerful performance by Warwick Comber (Blue Mage). Picture credit: Creative Futures Photography. Shearer’s Juliet commented, toward the end of the piece, ”we know what we are, but know not what we may be.” I came away from the performance certain that, although enjoy modern staging and contemporary interpretations, I prefer my Shakespeare plays as originally written—that is, complete. However, I’m glad I saw this production. The Third Beauty: Shakespeare's Women encourages reflection on the beauty of the spoken word, and on issues of gender fluidity, as the artists move from their feminine gothic finery to a reveal of their inner-selves. There is certainly the possibility of engaging in ‘spot the play,’ if you know your Shakespearian texts. But a knowledge of Shakespeare’s works is no prerequisite. Go with an open mind—for a chance to hear extracts from many popular Shakespearean texts, performed by those who love the spoken word, in the fabulous acoustics of the Spring Hill Reservoir space. An opportunity to reflect on the beauty of the words, and also on the nature of beauty itself. Verdict: I prefer my Shakespeare as ‘complete’ plays, but this is an interesting idea performed by a strong team. Audience tip: Promenade performance so bring walking shoes, watch out for uneven surfaces, and be aware that there is no mobility access. There is a warning for strobe lighting and haze. The production runs for 12 performances, 4-20 October 2018 (13 October 3:00pm, 7 & 14 October 5:00pm. In addition, 9:30pm shows in October on 4, 5, 6, 12, 13, 18, 19 & 20). Tickets available online $28 ($20 Concession—and all tickets at the 3pm & 5pm shows), unless booking the acting workshop & twilight performance (14 October, $75 full, $50 concession). The show can also be seen as part of a double bill with heartBeast's production of Julius Caesar. The reviewer attended the Sunday 7th October 2018 show (5:00pm).